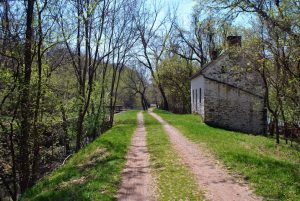 Spink’s Ferry was an established Potomac crossing long before the Canal was built. Josias Clapham licensed the ferry way back in 1757. Because the approach to his ferry landing was less convenient than a competing ferry just upstream, Clapham swayed the Virginia Assembly to approve a less expensive toll to compete. The ferry switched hands in 1816, but didn’t become known as “Spinks Ferry” until 1833 when John Spinks bought the property. Although Spinks stopped running the ferry by the Civil War, the nearby lock and its pivot bridge used for access to the river landing became the target for retreating Confederates after the Battle of Antietam. General D.H. Hill looked to disable Lock 27 after failing to destroy the Monocacy Aqueduct upstream. Interestingly, the Canal company dismissed the lockkeeper, Thomas Walters, for collaborating with the southerners. His neighbors came to his defense, explaining that the lockkeeper pleaded with the Confederates not to destroy the lock. Lock 27 was built mostly of red sandstone from both Seneca and Point of Rocks. You can see the rubble from the extended portion of the lock along the upstream channel. The stone lockhouse, once missing much of its front wall, has been restored.